Robi 500MB Internet 49Tk Offer! 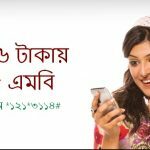 Bangladeshi Top telecom operator Robi all prepaid and postpaid subscribers are eligible to Robi 500MB 49Tk Offer. All customers can enjoy this offer with exiting validity. This offer is very special and lower for all internet users. The customers who want to know or activate this offer, just read this full article and follow our all instructions. We have all update information about the Robi Internet Package in here. If you want to know more or activate this offer, please follow the next instruction. Robi all prepaid and postpaid customers are eligible to buy this offer. If you activate Robi 500MB Offer, customers need to dial USSD Code *123*049#. Customers will charge to Tk49 with includes (VAT+SD+SC). To check your internet balance, please just dial *8444*88#. Validity this offer in 7 days and customers will use this data in 24 hours. Customers can use this internet package on the 2G/3G area network. All Robi subscribers can buy this offer in any time in a day. We hope customers can get more details about the Robi 500MB Internet 49Tk Offer. Here we will update in Robi 1GB YouTube 49Tk Offer. If you face any problem to activate this special internet offer, just comment here. We will answer as soon as possible.